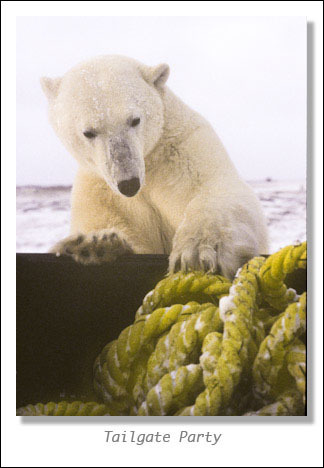 Recently I received another email showing the polar bears playing with sled dogs near Churchill, Canada. Many friends and fans have sent me this email over the years as I, too, have photographed polar bears. 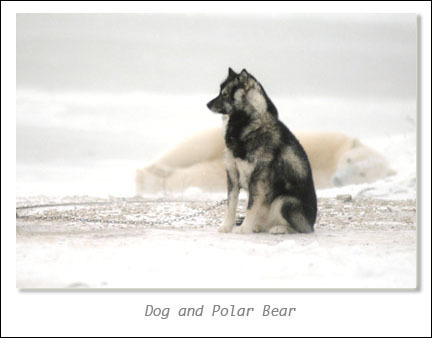 What many don’t know is that I also photographed the sled dogs with the polar bears. I shared coffee with the owner of the dogs while we warmed up in the pick-up truck I had borrowed. He asked me to look out for bears while he fed his dogs. He took a large block of frozen salmon from the back of his truck and proceeded to hack it up with an axe. I wondered what he was doing as he tossed the first few large hunks in the opposite direction of the dogs. In a matter of minutes a polar bear showed up and began feeding on the distraction. Then he fed his dogs knowing that the polar bear would be busy eating the treat he left for it. The amazing part was how the dogs just swallowed the frozen hunk of salmon without chewing it. Polar bears are known to be curious and this guy was no exception. He rose up on the tailgate to check out the rope that was in the bed of our truck. I grabbed a shot through the rear window as my photographer friend put the gear shift in neutral. The bear found the rope interesting, grabbed it with his teeth, and started pulling on it. The truck moved as the bear pulled on the rope. It was no strain for the bear, he pulled the truck without effort. The truck was like a little toy for him to play with. We weren’t exactly thrilled to be in the polar bear’s toy so we started the engine and the bear dropped down. Luckily the bear lost interest in us rather quickly.